From her red-roofed home near Papua New Guinea’s capital of Port Moresby, Isabelle Dikana Iveiri overlooks a giant plant used by Exxon Mobil Corp to liquefy billions of dollars’ worth of natural gas before it is shipped to Asian buyers. Dikana Iveiri can also see swaths of muddy shoreline, where mangroves have been felled for firewood by locals who don’t have electricity, gas, or money to buy either. But much of the promised riches, through taxes to the government, royalties to landowners and development levies to communities, have arrived well below Exxon’s own commissioned forecasts, if at all, according to landowners, the World Bank and the PNG government. “My family has been here a long time,” said Dikana Iveiri, one of several landowners interviewed by Reuters near the PNG LNG plant. “Our royalties are not going well; they are using our land but not paying us properly,” she said referring to both Exxon, which pays the royalties and the government, which distributes them. Exxon, community leaders and the government did not comment on Dikana Iveiri’s specific situation but in a statement to Reuters, Exxon said distribution of royalties and benefits to the LNG plant site landowners started in 2017. Cash payments to individual landowners would depend on how many landowners were in a precinct and were just one of the benefits communities received, Exxon said. The project employs nearly 2,600 workers, 82 percent of whom are Papua New Guinean and Exxon said it has invested $360 million to build infrastructure and pay for training and social programs. “We could not be more pleased to see how the benefits are flowing to the communities at the LNG plant site, to see how investments are being made in important infrastructure such as schools and health that demonstrates the process is a good one and it works,” ExxonMobil PNG Managing Director Andrew Barry told a mining and energy conference in Sydney in December. Barry said Exxon was hoping royalties would begin flowing in the pipeline and upstream areas “in the not too distant future”. PNG Prime Minister Peter O’Neill, who was part of the government but not the leader in 2009, said many of the disputes around PNG LNG stemmed from the way the government and Exxon proceeded with the project without first resolving landowner claims. “It should have been done before, it wasn’t only for Exxon and the partners but even the government at the time did not do the proper clan vetting, proper identification of the land owners – they allowed this project to go on without that,” O’Neill told Reuters. Treasury, the treasurer, and the Prime Minister’s spokesman declined to provide responses to Reuters’ questions about the project. PNG LNG was completed ahead of schedule and exported 8.3 million metric tonnes in 2017, compared to its anticipated design capacity of 6.9 million tonnes, according to the project’s website. Exxon does not disclose the project’s revenue or profits but research house Morningstar estimates it has generated $18.8 billion in revenue for Exxon and its partners since production started in 2014. The project’s break-even price of around $7.40 per million British Thermal Units (mBTU) compares favorably to an average over $10/mBTU for eight recent gas projects in the region, according to analysis by consultancy Wood Mackenzie and Credit Suisse. The project’s contribution to Papua New Guinea’s economy and government finances is less clear. PNG’s Treasury does not report project income figures, but government budget papers show tax revenue flowing from PNG LNG has been well below expectations. In its 2012 budget, the PNG government estimated it would receive $22 billion in revenue over the project’s life to 2040. A 2017 World Bank analysis found the project partners had negotiated favorable methods of calculating royalties to the government that allowed them to take various deductions. Combined with tax concessions, the project created “a complex web of exemptions and allowances that effectively mean that little revenue is received by government and landowners,” the World Bank said. Exxon’s partners, which include Australian-listed Oil Search Ltd and Santos Ltd, and a subsidiary of Japan’s JXTG Holdings Inc, referred Reuters’ questions to Exxon. A second LNG project, Papua LNG, led by France’s Total with Exxon and Oil Search as minority partners, is scheduled to finalize an agreement with the PNG government in early 2019. 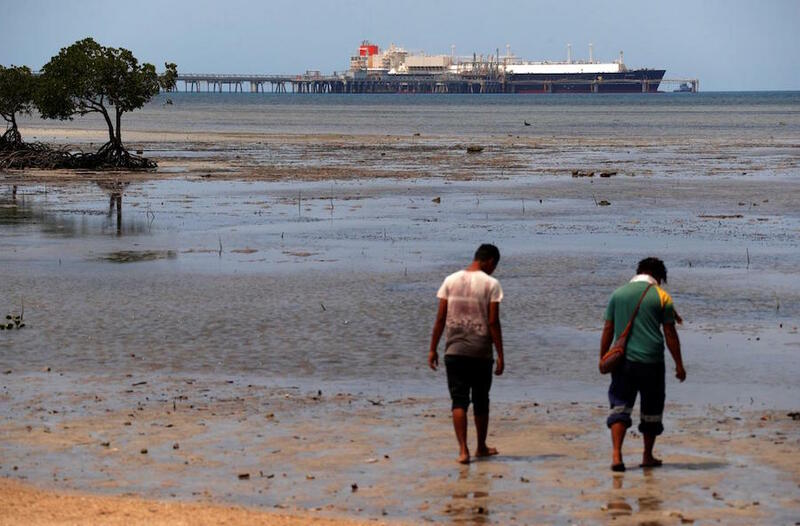 “The experience of the first project developed by Exxon and Oil Search, there was some criticism, some mistakes,” Total CEO Patrick Pouyanne told Reuters in an interview in Port Moresby, referring to relations with landowners. Exxon did not respond to requests for comment on Pouyanne’s statements. Disputes have broken out within communities near PNG LNG facilities as landowners fight to have their claims recognized. “Our clans fought each other, but now there is peace; we are one team fighting Exxon,” said Tape. 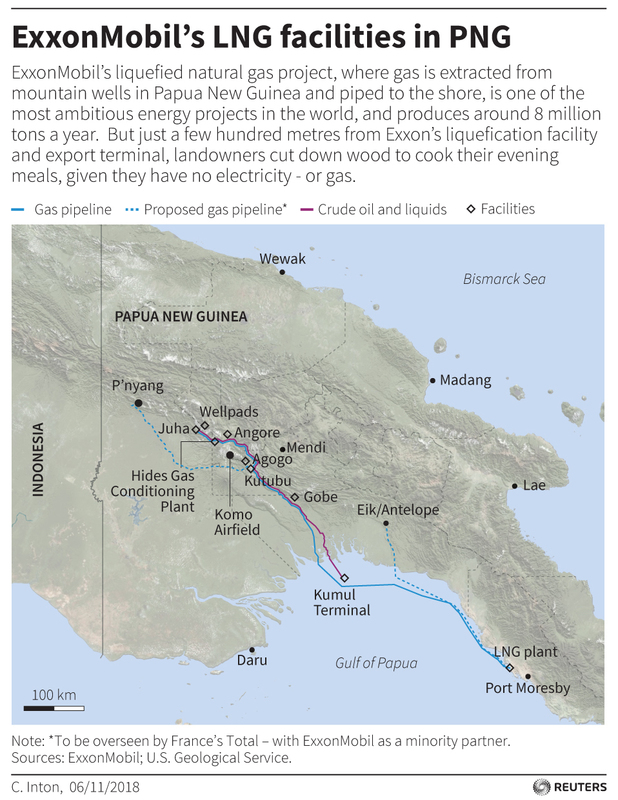 Christopher Havieta, the governor of Gulf Province, where gas fields for the new project are located, said locals wanted to avoid the experiences of Exxon’s PNG LNG.